Facebook is the best thing to happen to online marketing since well, Google. And I’m not the only one who thinks so. Facebook generated $8.81 Billion dollars in revenue in Q4 2016 from more than 3M advertisers. You should probably jump in if you haven’t already. If you want to compete, though, you need to know the platform inside and out. You can easily waste a lot of money if you don’t know what you’re doing. Use this guide to make sure you’re maximizing ROI instead. It includes a unique process we’ve developed at our marketing agency that minimizes cost and maximizes customer acquisition, our checklist for running campaigns, the dashboards we’ve created to monitor success, descriptions of metrics we track, and a bunch of our hard-earned lessons sprinkled throughout. The quickest way to waste a lot of money on Facebook ads is to promote bottom-of-the-funnel offers or decision-stage offers to Facebook users who don’t know you yet. Instead, apply the classic AIDA (Attention, Interest, Desire, Action) concept or HubSpot’s Inbound marketing methodology to your ad campaigns by creating ads that are in tune with the awareness (or lack thereof) your target audience has of your product or service. You might get lucky when you launch a direct-response campaign to cold audiences or promote promotional content and get a ton of conversions. We get lucky once-in-awhile and I wish it was this easy all of the time. But, from our experience running thousands of campaigns for hundreds of clients, this is not a predictable, sustainable or repeatable process for achieving positive results. The key to success is to first warm-up cold audiences by showing ads that educate and that includes an easy-t0-oblige call-to-action (CTA). The CTA should only require a small amount of commitment from the prospective customer, like watching a video or reading some ungated content. Then, once an individual is educated on your company’s offering from your first ad, it makes more sense to serve them an ad that pulls them further down your funnel and may require more of a commitment, like completing a form or even purchasing your product. This multi-step process is similar to how any good inbound marketer would offer an ebook to a new website visitor, then present a call-to-action to talk to a salesperson when a returning visitor is qualified. Warming up your audience will increase your conversion rates and lower your overall cost per conversion. Why? Unlike paid search ads served by Google or Bing, Facebook users aren’t necessarily searching for a product or service. In Google, users see adverts because they literally searching for a solution or answers to a problem they have. So, Google pay-per-click adverts that promote a product, service or company can generate high click-through-rates and conversion rates. Facebook ads, on the other hand, are interruptive. A Facebook user is browsing, socialising and interacting with friends and family, not necessarily looking for a product or service. Facebook users don’t want to be bombarded with spammy, overly promotional messages. So, how do you do it? They key is to plan multi-step ad campaigns that change as your buyer becomes more aware of you. At Yello VeeDub, my marketing firm, we do not create Facebook ad campaigns with less than two steps. In fact, we often run campaigns with four to five steps to really maximize our overall conversion rate. For the first step of your campaign, the goal is to simply build a custom audience of people engaged with our client’s content, not get conversions. Therefore, the objective is to get as many simple interactions as possible, like video views or clicks to content on a website or facebook page. Do not expect to generate an immediate ROI from this first step. There are several types of audiences that you will build in this first step. The custom audience targeting options Facebook provides are game-changing and (in my opinion), where Facebook truly excels. You can target your customers (by uploading a list of them to Facebook), your website visitors or people who have interacted with your content on Facebook. You can also create a list of people who “look alike” to any of the aforementioned audiences (called a look-alike audience) or a list you build on Facebook based on Facebook’s knowledge of their interests and behavior, called a Saved Audience. Since we’re usually tasked by our clients to attract new customers, we often start with a saved audience. Others often reference this cold audience targeting as Facebook interest & behaviour targeting. Our goal is to create a custom audience by getting the Saved Audience to interact with our client’s content on Facebook. Confused? Read our article on the different types of audiences and how to use them. If you target your audience this way, remember this is a completely cold audience; people who have never heard of you, nor visited your website or received a message from you. So, the call to action in these initial ads should be simpler to oblige, like a click, video view or page like. Since the goal of this step is to simply build a relevant targeted custom audience of engaged prospects, promote content that speaks to your ideal prospects, that informs and educates them in the awareness stage of their buying process. 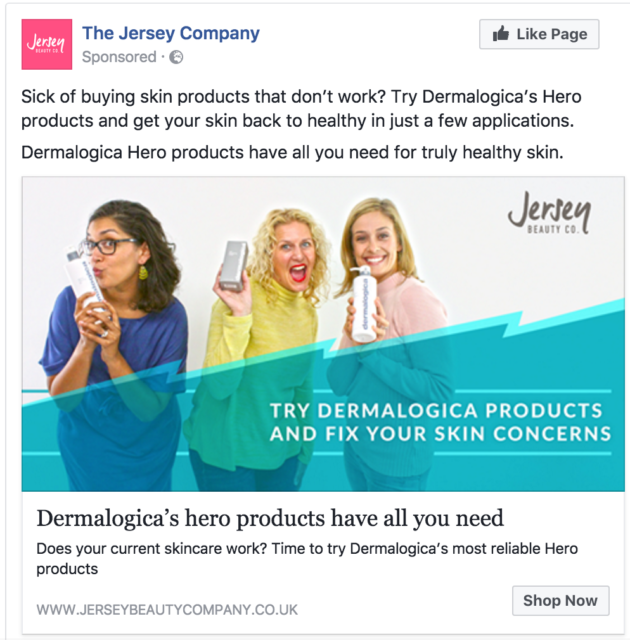 When the content you promote is interesting enough to interrupt their Facebook browsing, these people are indicating potential interest in your product or service. Even if you don’t take this approach at first, you may need to eventually. After running ads to audiences like previous website visitors, customer lists or Facebook fans for a while, you will get diminishing returns. To keep your conversion rates high or just reach a bigger audience via Facebook ads, you’ll need to turn cold audiences warm. Once you’ve created an audience who knows who you are, you can start serving ads to them designed to generate conversions. Serving advertising messages to your ‘warmer’ audience will increase the conversion rate of these ads and your overall campaign. Heavier calls to action are more appropriate at this stage. Feel free to promote ebook downloads, enquiry forms or products for purchase, like the ad below shows. You must install the Facebook Pixel in order to build a custom audience of website visitors. 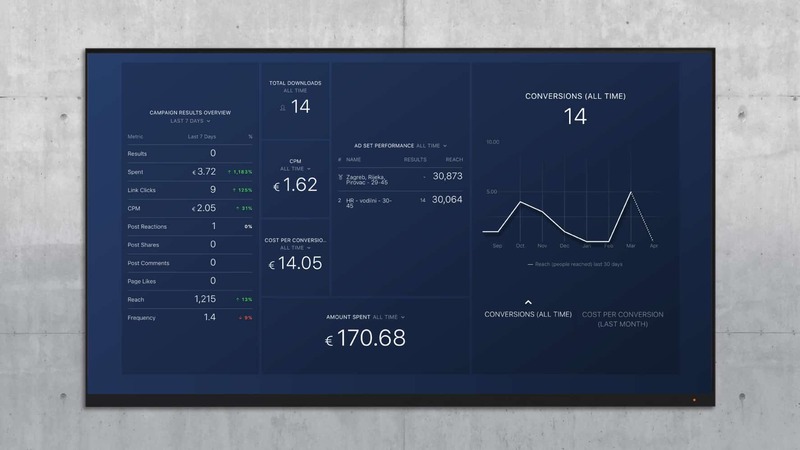 The Facebook pixel will also allow you to report ROI of all offsite conversion costs. If you don’t have it on your website, stop reading now and go add it immediately! Facebook stores Facebook users’ visits to your website for up to 6 months, but only from the day it is added. It can’t retroactively give you this information. To ensure a low cost per conversion over an extended period of time, you must make sure your website converts visitors to leads and customers at a high rate too. In other words, don’t do Facebook ads unless your website already works. We run Facebook advertising as a lead generation activity for clients with sales teams or as a loss leader activity for high-lifetime-value customer acquisition for e-commerce companies. We put leads generated from Facebook into fully-optimised digital marketing funnels with high-converting website pages and blog posts, compelling and well-designed landing pages, properly configured lead scoring, smart content and email nurturing that adapts based on the interest of the contact, and either a well-optimized storefront for selling online or a well-designed sales process for products sold offline. This will help ensure a strong ROI from Facebook ads initially and in the long-run. To do this effectively, we became HubSpot partners a year ago. Based on our own success with the platform, we implemented it for seven of our clients during a three-month period. But, we didn’t do it for us. We did it because we consistently realized the ROI from Facebook and other online advertising was much more positive when HubSpot and inbound marketing systems were deployed first. HubSpot combined with Facebook ad campaigns enables us to influence our clients’ buyers from the first impression on Facebook to closed sales. When we get requests to manage Facebook ad campaigns, we invariably end up talking about overall digital strategy, because Facebook ads are just a channel for a client’s message. Not a be-all, end-all. As HubSpot has taught us, the content and messaging strategy — developed through a persona research and definition process — both play an important role in the ROI of their Facebook advertising. 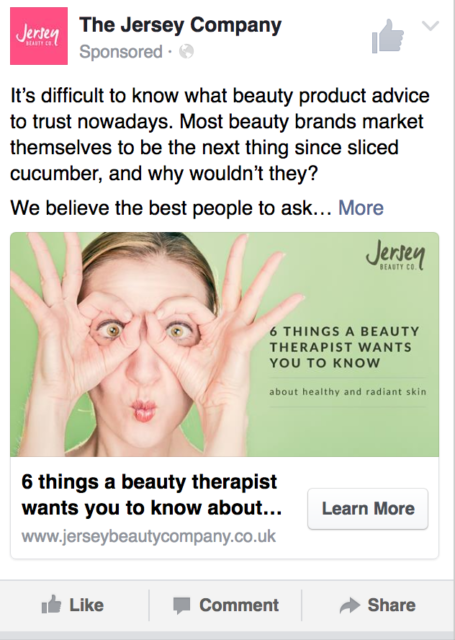 Unless the right technology and marketing messaging is all in place, we will not run any Facebook adverts as this is akin to gambling – we might get lucky, but just as likely we will not. As mentioned above, we run different types of campaigns for each client. We always run campaigns to build custom audiences. Then, depending on our client’s business model, we run conversion campaigns that are focused on either lead generation or online sales. While some of the metrics we track for each of these campaigns are the same, we have different metric views for each campaign objective. We use the following dashboard to monitor all of the metrics described below. Website clicks. For campaigns with this objective, this is an easy way to see the size of the audience we are building. Cost per click. This helps us benchmark the the cost of building audiences for in a specific campaigns. Cost varies considerably based on the specific interests and locations the campaign targets. Therefore, we often prioritize or de-prioritize different campaigns based on cost per click. Cost per 1000 impressions (CPM). CPM proves the value of showing educational ads at this stage, and allows us to compare the cost of these campaigns with later stage ads. This metric helps justify our two step process, as we consistently get a lower CPM at this stage, often as much as 20% lower. We also monitor CPM of these campaigns over time to ensure the campaign isn’t beginning to fatigue. Often, competition changes for a specific audience or a message just stops working, resulting in a higher CPM. Frequency. This is the amount of times ads are seen by the same person. We usually leave a campaign running until the frequency reaches six to eight. We do this to avoid complaints from Facebook users who will sometimes report ads for being spammy if they see them too many times. If we are still getting good results, we’ll switch the campaign ad and target the audience again. Ad set and ad performance. An ad set is a group of ads that share the same budget and audience targeting. We monitor ad set performance metrics to help us understand what content is resonating with the audience and this influences any future content creation. Sometimes, however, Facebook favours the ad content that gets more attention first, and stops displaying other ad sets promoting other content. So if a content topic is not getting any Facebook love, we normally remove it from the current ad set and re-test it on its own in a duplicate ad set to see if it’s any good or not. Lastly, make sure you organize your ad sets by content topics. The template above will allow you to see link clicks by topic, enabling you to quickly identify which topics help you inexpensively reach bigger audiences. We highly recommend running video ad campaigns at the top of your Facebook ad funnel. Why? Video campaigns can quickly move a buyer from awareness to action. Well designed videos can warm up a cold audience and get them to become a lead or buy a product too, all in one watch. Another great thing about video is that you can add text and links to the video description, such as links to ebook or software trials, product pages or frequently asked questions. Percentage of video watched. Facebook allows us to measure how often the video is viewed 25, 50, 75 or 100% through to the end. Not only does this metric help us understand if the video content is resonating with the audience, it helps us optimize the video content and our multi-step campaigns too. For example, if we see that people are not watching past the 25% point, we might test a new video with a new opener. But, if users are watching a high percentage of the video, we’ll introduce stronger and earlier calls to action in the video. 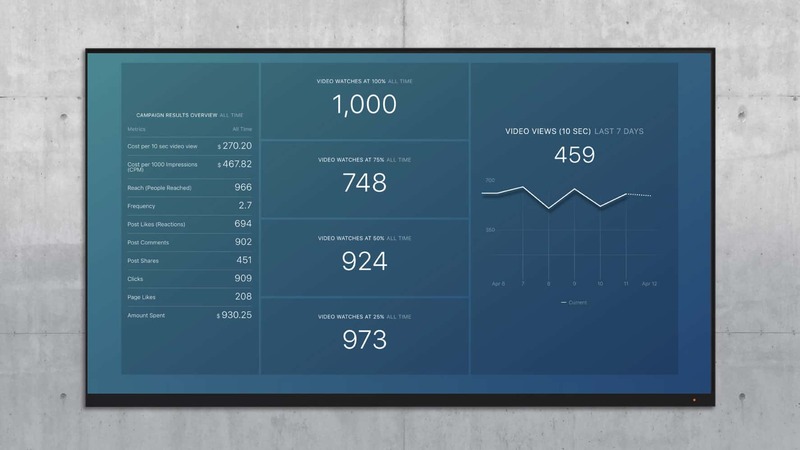 We use the following dashboard to monitor video completion metrics. We monitor slightly different metrics depending on the conversion type. 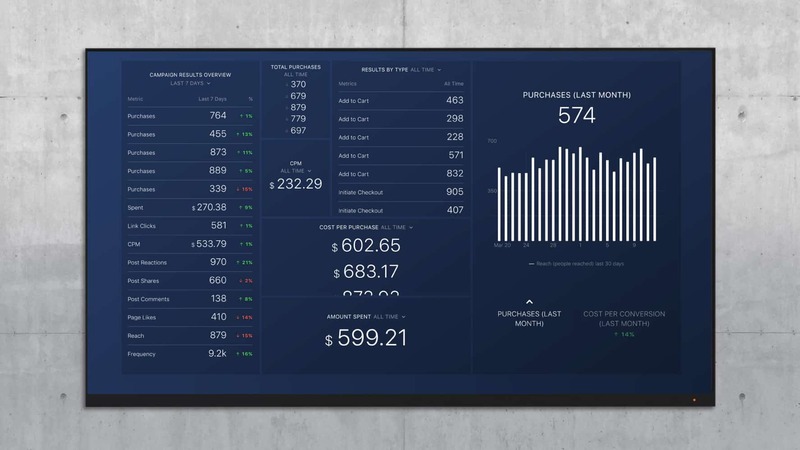 Here’s the dashboard we use for e-commerce tracking. When we set up a conversion Facebook campaign for e-commerce, we usually choose “Add to Cart”. Since a higher percentage of people add items to a cart than buy right away, choosing this action gives Facebook more data points for optimising the campaign. But, to avoid wasting ad dollars, we always monitor purchases and cost per purchase on our dashboard, as you can see above. If you run an “Add to Cart” campaign, but want to monitor sales, you need to go to a separate screen and create a custom view in Facebook. Instead, we use the dashboard above, since it lets us view everything in one spot. Cost per result. As the name of the metric suggests, this is the cost to get one conversion. This metrics drives our decision to stick, to optimise, or to fold campaigns. Once we have a realistic cost per conversion benchmark, we set a maximum cost per result for the campaign. We stop the campaign if we go over the maximum acceptable cost per conversion amount, no matter what the other metrics are showing. It’s important to note that CPM is always higher for conversion focused campaigns. As far as stories of entrepreneurial success go, few are as inspirational as the one of Facebook. Mark Zuckerberg is pretty much living every start-up owner’s dream. I mean, what’s not to love? Having started off with my agency doing social media management in the glory days of organic content, I’ve witnessed every iteration of the algorithm and the subsequent evolution to paid media. And I still love working on it! It’s smart and current. Moreover, clients love the immediate results and ability to improve results quickly and over time. Facebook’s ability to accurately target audiences has changed the marketing landscape for the better (and for good). Again, what’s not to love? Well actually, there are two things, come to mention it. For me, the user experience of the Facebook Ads Manager leaves much to be desired. Firstly, the interface is constantly changing! Things keep moving around without any advanced warning, making it hard to stay efficient. While this is frustrating, the biggest pain point for our agency is the lack of a robust, yet simple monitoring and reporting system. As an agency owner, I consider it our responsibility to deliver the best result at the lowest cost. But, Facebook does not make it easy to quickly view campaign performance. Further, we need to report results as simply as possible; to demystify results and strategy for clients, so they only see the data that is pertinent to them, in one accessible snapshot. 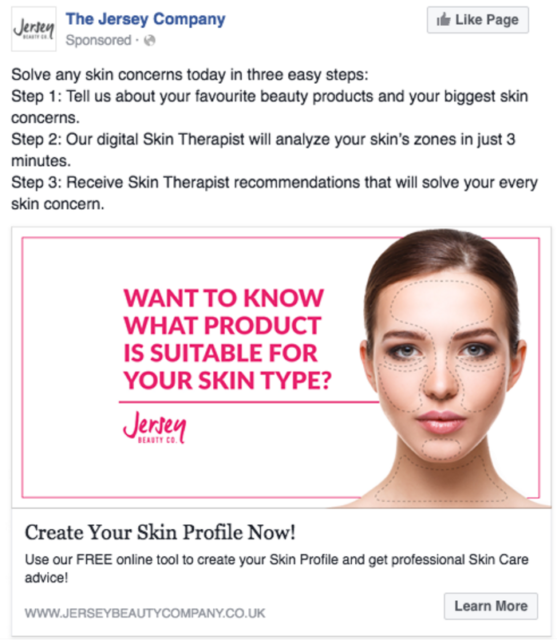 However, the Facebook Ads Campaign Overview dashboard is like a cargo ship overloaded with percentages and pie charts, clunky and cumbersome to manoeuvre, crowded with irrelevant metrics. One day I had had enough. I became increasingly frustrated with building client reports by exporting screenshots from a large collection of different screens from multiple software systems, especially Facebook’s ad platform. Not only were we wasting an incredible amount of time, we weren’t effectively communicating results and our efforts to clients. Luckily for us, I stumbled upon a blog post from OverGo Studio proclaiming his new found love for Databox. I soon realized Databox was designed exactly for our needs! Finally, there was a way to pull the essential data from Facebook and present it in a slick, branded interface without overwhelming my clients, and it didn’t take my team hours and days to compile. But it gets better. You see, I initially thought what I needed was a simplified Facebook Ads reporting tool and that was why we were going to use Databox. However, what we soon discovered was that we could actually use Databox to monitor the performance of our campaigns internally. Normally, my team and I would have to hunt around Facebook’s interface to find what we needed. But using Databox, we can pull all the important metrics into one spot. 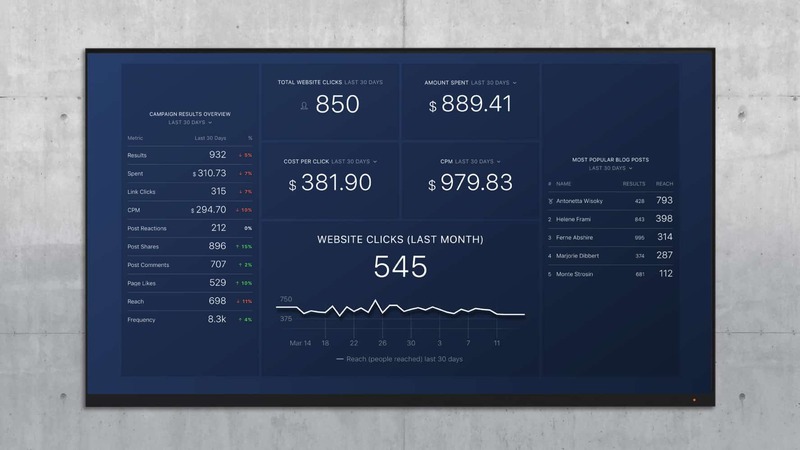 Databox became our facebook ads monitoring and reporting interface, saving us hours each month and giving us and clients easier and more frequent visibility into campaign metrics. We now use Databox boards to monitor key metrics. These dashboards (pictured above and available for you to download into your Databox account with one click) influence our optimisation decisions. Without logging into Facebook’s system, we can decide which campaigns to put more budget behind, what campaigns and content to adjust and which campaigns to stop. The data is easily accessible via our desktop or mobile device, and crystal clear from the get go. We still log into our Facebook ad manager daily, but now we don’t spend time looking for data and insights in there. We can make changes and get back out. All-in-all, we are able to re-focus our time away from hunting around Facebook’s interface and towards improving campaigns. Below is the process we use (which now includes the Databox dashboards) to monitor, optimise and report on our Facebook Ad Campaigns. For best results and to make sure we don’t forget anything, we use a checklist when creating a Facebook campaign or setting up a new client. Tailor the Text: Tailor your ad text based on your offer and your target audience. It’s very important to use language that does not violate Facebook Ads Guidelines. For example, don’t use language that implies you know the targeted user’s race, religion, age, sexual orientation, medical condition or criminal history. Also, avoid terms like “you” or “your” that imply you know something about them. Success Image: Use a success image to grab your audience’s attention and suggests your product or service works. For example, if your company provides dental services, show a photo of people with big smiles and healthy teeth. Read more about success images as well as images to avoid, like medical devices or body parts in isolation. Target Your Audience: If you have already created your Audiences, it’s time to engage them. Select the most appropriate offer for your audience. For example, a cold audience would be Facebook users who have never heard from you before, not visited your website yet or not aware of your brand. Normally you would target these types of audiences with your educational content as way of building more relevant, targeted audiences that you can later promote bottom of the funnel offers to like downloads and products for purchase. Setup the Facebook Pixel: The Facebook pixel allows you to measure your off-site conversion metrics (which are vital) and allows you to create custom re-targeting audiences (website visitors, email lists) following our two-step audience warming process above. The simplest way to check if you have a Tracking Pixel on your website is by installing the Facebook Pixel Helper on your browser. Choose Your Campaign Objective: Choosing the right campaign objective is crucial for your campaign’s success. Make sure you choose your campaign objective based on your end goal. Facebook optimises your campaigns according to the main objective you choose. So if you are looking to get more conversions (e.g. downloads, purchases, leads, etc. ), you will need to select website conversions as your campaign objective. If you select website clicks as the campaign objective, Facebook optimises for this action – they will only be focused on getting more people to click your content as opposed to finding more similar uses to download your content. Set Your Budget: Would you like to set a Daily or Lifetime Budget? We have found lifetime budget works better. There’s little risk if you’re targeting the right audience and Facebook spends your budget only when there is an opportunity to optimize your desired result like clicks, conversions, video views. Also, with lifetime budget, you don’t have to worry that you will run out budget during a given day. However, this does not mean that you should not run daily budgeting if you’re worried about spending all your budget quickly or if you can not handle a high volume of incoming inquiries on a given day. There is no right or wrong way. It just depends on how often you will be monitoring your campaign and the size of your budget. Facebook ad system provides one of, if not the most robust targeting and prospect nurturing capabilities out there. The system enables targeting like never before, nurturing through multi-step ad campaigns and audiences and continuous optimization based on data. However, it’s not simple. You must build a system for starting and managing campaigns. We’ve invested hundreds of hours running Facebook Ad campaigns. Every month, we learn new lessons that we can then apply to all of our client’s campaigns. And each month, we re-evaluate our current ad optimization and reporting processes, so that our entire team can maximize results for the next campaign and the next client. I hope the process above helps you shorten your learning curve and hasten your ROI, like it does for us. Brendon Macdonald Brendon is the leader of Yello Veedub, an inbound marketing agency based in Liverpool, UK.